Background and objectives: Although well-described for patients who require dialysis, information on transfusion burden related to anemia in the nondialysis patient population with chronic kidney disease (CKD) is lacking. Design, settings, participants, & measurements: A retrospective study was conducted of patients with CKD and chronic anemia from 2002 through 2007 in the Veterans Administration Healthcare System. Included patients had stage 3 CKD or higher and anemia (one or more hemoglobin [Hb] levels <11 g/dl or received anemia therapy [erythropoiesis-stimulating agents [ESAs], iron, or both]). The outcome of interest was transfusion events, which was evaluated in relation to the absolute Hb level and changes in Hb levels overall and according to the type of treatment received (no treatment, iron therapy, ESA therapy, or ESA and iron therapy) concurrent with each Hb measurement. Results: Among 97,636 patients with CKD and anemia, we observed 68,556 transfusion events (61 events per 100 person-years), 86.6% of which occurred in inpatient settings. At all Hb levels, transfusion events were highest during periods of no treatment and increased with declining Hb levels. Between an Hb of 10.0 and 10.9 g/dl, the transfusion rate was 2.0% for those who received an ESA, iron, or both and 22% for those who received no treatment; at an Hb level of 7.0 to 7.9 g/dl, the transfusion rate was 10 to 12% for treated and 58% for untreated patients. Low absolute Hb levels but not Hb changes was most predictive of a transfusion even after adjustment for patient case mix. Conclusions: Transfusions are still used to treat anemia in patients who have CKD and do not require dialysis, although they occur considerably less frequently in patients who receive other available anemia therapies. Persistent anemia is a common complication for patients with chronic kidney disease (CKD) (1–3), primarily stemming from declining endogenous erythropoietin production (4). After the addition of erythropoiesis-stimulating agents (ESAs) to available treatments for chronic anemia, there has been a marked decline in transfusion events in this population (5). Current anemia management guidelines recommend treating hemoglobin (Hb) levels to 10 to 12 g/dl and using the lowest possible ESA dosages to avoid the need for red blood cell transfusions (6). Although transfusions are considerably safer than in the past (7), transfusion-related risks persist. Risks include iron overload; transfusion reactions; transmission of infectious agents; acute lung injury; and the development of alloantibodies, which can affect a patient’s ability to receive organ transplants (8–9). In addition, significant costs are associated with blood transfusions, including storage and acquisition (10). Ibrahim et al. (11) described a pattern of declining transfusion use between 1992 and 2005 subsequent to the introduction and widespread adoption of anemia management with ESAs using data from the US Renal Data System. The authors also showed that the mean outpatient Hb level before transfusion events increased from 9.0 g/dl in 1992 to 10.3 g/dl in 2005. In the nondialysis setting, anemia management patterns, particularly use of transfusions, have not been explored because of the absence of a national surveillance system that captures information on routine Hb measurements and available anemia management therapies, including ESAs and iron. The Veterans Health Administration (VHA) is a national network of inpatient and outpatient care facilities with longitudinal data on diagnoses, procedures, medications, and laboratory values that may be used to characterize the use of transfusions in a single, nationwide health care system. We used national VHA data to estimate transfusion use and predictors of transfusions in patients with CKD and anemia according to their receipt of alternative anemia therapies. This was a retrospective cohort study that used national clinical and administrative data from the VHA system. This study was conducted in accordance with Good Pharmacoepidemiological Practice with oversight from the institutional review board and research and development committees of the VA Boston Healthcare System, Jamaica Plain campus. We extracted data from national VHA administrative and clinical data repositories, including the National Patient Care Database, Decision Support Systems database, and Pharmacy Benefits Management system. Patient-level data captured in the VA national databases system include (1) demographic characteristics; (2) inpatient and outpatient diagnoses (International Classification of Diseases, Ninth Revision, Clinical Modification [ICD-9-CM] codes and procedures [Clinical Procedural Terminology and ICD-9 procedure codes]); (3) inpatient and outpatient medication use; (4) inpatient and outpatient laboratory tests; (5) mortality information; and (6) eligibility information. While VHA beneficiaries who are aged ≥65 years may also be eligible for Medicare health insurance, Medicare data were unavailable to researchers at the time this article was written. Non-VHA hospitalizations that were reimbursed by the VHA were captured; however, laboratory and medication data are unavailable for these stays. From January 2002 through October 2007, we identified all patients who had two outpatient serum creatinine measurements at least 90 days apart consistent with an estimated GFR (eGFR) of <60 ml/min per 1.73 m2, based on the four-variable Modification of Diet in Renal Disease (MDRD) equation (12) and had not yet initiated dialysis. We required all patients to have at least 1 year of VHA health care use before inclusion in the study. We excluded patients who were undergoing treatment with an antineoplastic agent or AIDS medications or those whose initial eGFR was <60 ml/min per 1.73 m2 but then exceeded 60 ml/min per 1.73 m2 after meeting the inclusion criteria. We then limited the population to patients who had at least one outpatient Hb level <11 g/dl or who were actively being treated for anemia with ESAs, iron (intravenous or oral), or both. The date of the first Hb level of <11 g/dl or recorded treatment was assigned as the beginning of the study period (index date). We evaluated the severity of anemia over time by recording all Hb values collected at baseline and during follow-up in the conduct of general clinical care and categorized them as <7.0, 7.0 to 7.9, 8.0 to 8.9, 9.0 to 9.9, 10.0 to 10.9, 11.0 to 11.9, and ≥12.0 g/dl as well as either inpatient or outpatient. We also calculated the change (in g/dl) since the last outpatient measurement (no greater than 180 days apart) and grouped these changes into the following categories: No change or an increase in Hb or a decline of 0.1 to 0.9, 1.0 to 1.9, 2.0 to 2.9. or ≥3.0 g/dl. We collected serum creatinine values similarly and then grouped eGFRs into CKD stages (15 to <30, 30 to <44, or 45 to <60 ml/min per 1.73 m2). We recorded all new ICD-9 diagnoses for anemia and/or CKD and all hematologist and/or nephrologist specialty care visits that occurred during the study period. We assessed anemia treatment at each Hb measurement throughout the study period. We classified patients according to the type of therapy they were receiving—ESA only, iron only (intravenous or oral), ESA+iron therapy, or no treatment—allowing patients to switch between treatment groups throughout the study period. Iron laboratory parameters such as serum ferritin levels and transferrin saturation percentage were unavailable. We identified all patients who received a red blood cell transfusion (regardless of type) in either the inpatient or outpatient setting using Clinical Procedural Terminology 4 code 36430 and Healthcare Common Procedure Coding System codes P9010, P9016, P9021, P9022, P9038, and P9040 (outpatient) or ICD-9-CM procedure codes 99.0 and 99.04 (inpatient). We excluded transfusions that occurred as a result of an acute bleeding event, diagnosis of pernicious or hemolytic anemia, or surgery within the preceding 30 days (operative or postoperative). The Hb measurement that was most proximal to but preceded the transfusion event was assigned as the Hb measurement that prompted the transfusion. Patient characteristics were assessed during the year before the index date (entry period) and at each available Hb measurement during the study period. Patient characteristics included demographics (age, gender, race); eGFR and CKD stage; comorbid diagnoses including the presence of (yes/no) coronary heart disease, atrial fibrillation, heart failure, stroke, hypertension, chronic obstructive pulmonary disease, diabetes, and hyperlipidemia; and medication use, based on one or more prescriptions (yes/no) for the following medications: lipid-lowering drugs, insulin, and oral hypoglycemic agents. We report population characteristics by baseline anemia therapy group (no therapy, iron only, ESA only, and ESA+iron) using frequencies and percentages for categorical variables and medians and interquartile ranges (25th and 75th percentiles) for continuous variables. We also report the number of Hb measurements and the overall mean Hb level by treatment group. We estimate the proportion of transfusion events per Hb measurement that occurred in the population overall and by treatment group according to the Hb category. We estimate the effect of current Hb level on the risk for transfusion using a logistic regression model that accounted for multiple observations per patient using generalized estimating equations with an AR(1) covariance structure, yielding odds ratios (ORs) and 95% confidence intervals (CIs) adjusting for current patient characteristics. We report the risk for transfusion related to recent change in Hb levels and, separately, the joint effect of Hb change and absolute Hb level. All analyses were conducted using SAS 9.1 (SAS Institute, Cary, NC). We identified 97,636 patients who had stage 3 CKD or higher, had evidence of chronic anemia, and met entry criteria. Baseline patient characteristics by treatment status are presented in Table 1. At baseline, 35,420 (36.3%) patients received iron-only therapy, 16,439 (16.8%) received ESA-only therapy, 10,413 (10.7%) received ESA+iron therapy, and 35,364 (36.2%) received no therapy. Patients who received ESAs tended to be younger. Black patients were more likely to receive one of the available treatments. Untreated patients had lower median Hb levels (8.8 versus 10.1 to 10.9 g/dl). ESA users tended to have eGFR values <30 ml/min per 1.73 m2, whereas untreated and iron-only-treated patients tended to have eGFR values >30 ml/min per 1.73 m2. ESA users were almost twice as likely to receive care from a nephrologist compared with untreated and iron-only-treated patients (37.7 versus 14.7% and 40.6 versus 19.7%, respectively); a similar pattern was observed for hematologist care. Regarding comorbidities, treated patients had a higher prevalence of diabetes and lower prevalence of hyperlipidemia and those who were receiving iron had the highest levels of hypertension, coronary artery disease, congestive heart failure, and chronic obstructive pulmonary disease. The average duration of follow-up in the system was 294 days (SD 450 days). The average follow-up time for patients while in each of the treatment groups was 60 days (SD 225 days) for untreated, 194 days (SD 362 days) for iron-only, 316 days (SD 429 days) for ESA-only, and 434 days (SD 471 days) for ESA+iron patients. During the study period, 63% of untreated patients remained untreated and 74% of those who were receiving treatment at baseline remained in their initial baseline treatment group. In addition, 13,254 patients initiated iron therapy, 12,013 initiated ESA-only therapy, and 3761 initiated ESA+iron therapy. In total, 42,030 patients received only iron, 19,767 received only ESAs, and 28,029 received both ESA+iron therapy. During the first year of the study period, the mean number of Hb measurements per patient was 1.56, 1.67, 1.94, and 1.76 for untreated, iron-only-, ESA-only-, and ESA+iron-treated patients, respectively. Similarly, the mean Hb levels were 9.3 (SD 1.5), 10.1 (1.6), 10.8 (1.9), and 10.6 g/dl (1.8 g/dl), respectively. Among the 97,636 subjects in our study, there were 74,401 red-cell or whole-blood transfusions during the study period, and 68,260 (91.7%) were included in this analysis. Of the 6141 excluded transfusions, 70.1% occurred on or within 30 d of surgery, and 33.5% occurred subsequent to a bleeding event. The majority of the 68,260 transfusions were in the inpatient setting (84.5%) with an average length of stay of 14.5 d (SD = 24.4). The average number of transfusions per person was 1.8(SD = 2.6). The mean Hb for inpatient transfusion was 8.9 g/dl (SD 1.6 g/dl) and was slightly lower for outpatient transfusions (8.5 g/dl [SD 1.4 g/dl]). Among the transfusions, 54.8% were among untreated patients; 19.9% among iron-only-treated; 8.5% ESA-only-treated; and 16.8% among ESA+iron-treated patients. Patients who received a transfusion often received multiple transfusions while in a particular treatment group. During the study period, 62% of the 24,358 untreated patients received at least one transfusion. Among treated patients, 35.3% of the 42,030 iron-only, 24.3% of the 19,767 ESA-only, and 30.2% of the 28,029 ESA+iron patients received at least one transfusion. 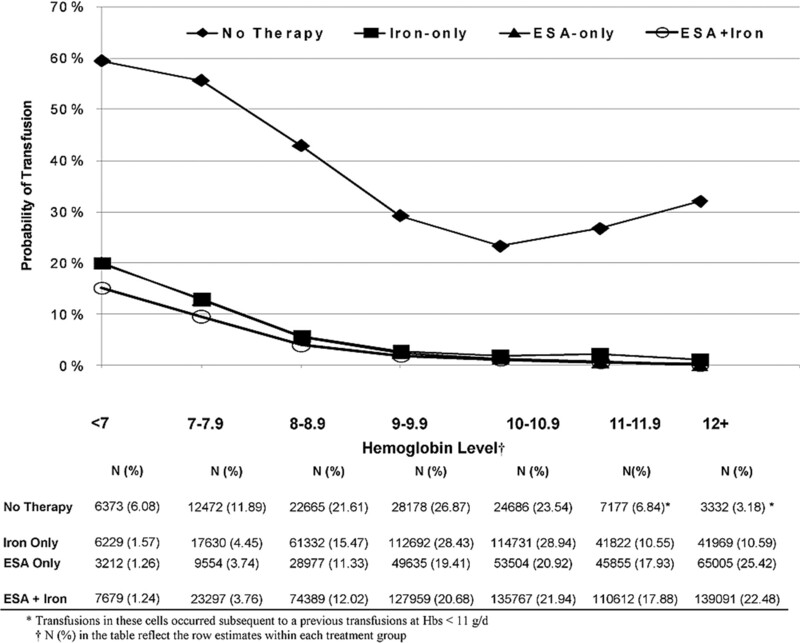 Transfusions occurred more among untreated patients at every Hb level and were rarest for patients who were receiving both ESA+iron (Figure 1). At Hb ≥10 g/dl, the probability of transfusion was <3% for treated patients but remained between 23 and 32% for untreated patients. Below 10 g/dl, the probability of transfusion among treated patients increased monotonically from 3% to between 15 and 20% as Hb level declined, whereas, among untreated patients, the probability of transfusion increased from 23 to 59%. Transfusion rates by Hb (g/dl) level according to the treatment status at the time the Hb was measured. In multivariate adjusted analyses, the absolute Hb level predicted the risk for transfusion in a monotonic pattern for Hb <10 g/dl (Table 2), with the strongest association among untreated patients. Compared with reference level of 10 to 10.9 g/dl, an Hb level <7.0 g/dl was associated with a 59% increased risk (95% CI 1.56 to 1.61). This association was attenuated among treated patients; among ESA+iron patients, an Hb <7.0 g/dl led to a 16% increased risk (95% CI 1.15 to 1.18). Transfusion risk did not differ at Hb levels ≥11.0 g/dl. Compared with untreated patients, those who were receiving therapy had a markedly lower risk for transfusion at each Hb level (OR 0.59 to 0.74) after adjustment (Table 3); however, across all Hb change categories, transfusion risk was considerably lower (OR 0.44 to 0.61) during periods of treatment (Table 4). The VHA system provides a unique opportunity to evaluate the existing transfusion burden in patients who have CKD and do not require dialysis according to Hb levels and anemia management. In this population of >97,000 veterans with stage 3 CKD or higher and anemia, we observed 68,000, primarily inpatient, transfusion events. As anticipated, the proportion of measured Hb levels that resulted in transfusion increased substantially as Hb levels declined below 10 g/dl. Across all Hb levels, transfusion burden was highest during periods of no treatment. A somewhat surprising finding was the large number of transfusions that occurred at values >11 g/dl, particularly among untreated patients, even after eliminating transfusions that were associated with surgery, cancer, and bleeding events. These data also suggest that the absolute value of the most recent Hb level rather than the magnitude of change in Hb (positive or negative) is the strongest predictor of a transfusion event, suggesting that physicians are responding to the presenting Hb level rather than evaluating recent trends in Hb. In this study, the focus was on the measurement of Hb, which was expected to be a primary decision point for ordering a transfusion. The results should be interpreted as being related to the probability of receiving a transfusion given that a Hb test was ordered. Because patients who receive therapy for anemia are subject to routine Hb monitoring (treated patients received on average 10 to 15 more Hb measurements during the study period), it is not surprising that the probability of receiving a transfusion per Hb measurement is lower than for untreated patients. Nonetheless, that upwards of 50% of untreated measured Hb levels resulted in a transfusion when the Hb was <10 g/dl (compared with <20%) suggests that earlier intervention could have a meaningful impact. Treated patients were much more likely to have a diagnosis of anemia and CKD and to have been referred to a nephrologist or a hematologist, highlighting the importance of specialist care. Limited data are available on transfusion use in the nondialysis CKD setting, particularly the Hb level that motivates the use of transfusions and how those patterns vary according to the ongoing clinical treatment of patients with CKD in the presence of anemia management. This is largely due to the absence of inpatient and outpatient laboratory results in most large databases (e.g., Medicare). Ibrahim and colleagues (11,13) recently described transfusion rates in both the CKD and dialysis populations using Medicare data. In their study of patients with CKD and diagnosed anemia, they showed that transfusion rates had declined over time and, as of 2004, occurred at an approximate rate of 17 to 20% (13); however, the authors were unable to characterize the CKD stage or the Hb level that preceded the transfusion event, relying solely on an ICD-9 code, which does not characterize the severity of anemia. In this study, we showed that transfusion rates were highly dependent on Hb level. Ibrahim et al. were able to assess Hb levels in the dialysis setting and showed that the mean outpatient Hb level immediately before the transfusion was between 10.0 and 10.5 in the most recent years reported (2002 and 2004). In comparison, the data from this analysis suggest that the Hb levels at the time of transfusion were substantially lower, on average 8.9 g/dl in the inpatient setting and 8.5 g/dl in the outpatient setting. This, however, may be explained by the considerable differences in the prevalence of ESA (90%) and iron therapy (70 to 80%) in dialysis versus nondialysis patients, previously reported (27% for ESA and 45% for iron) (14). The major strength of this study was the availability of longitudinal inpatient and outpatient laboratory and medication data in a large national patient population, which enabled us to evaluate multiple Hb measurements per patient. This allowed us to examine time-varying changes in Hb levels and their association with transfusion events. Given the longitudinal nature of the data and that patients can transition in and out of treatments according to time-dependent risk factors, we structured our analysis with Hb measurements as the basic unit of observation. We incorporated into our assessments the most proximal Hb measurement within the previous 6 months, assuming that any available Hb judged too distant in time or not currently relevant would be repeated. We restricted this study to patients with anemia attributable to CKD. Periods of time for patients with a transient anemia that resolved without either an ESA or a transfusion were eliminated from consideration, as were anemia episodes that were related to stroke, surgery, and gastrointestinal bleeding, which are associated with transfusion episodes but otherwise unrelated to CKD. In terms of limitations, although racially diverse, the VA CKD population has few women and a slightly older age distribution than other private health care systems. We were unable to quantify the magnitude of the transfusion burden in terms of units of red blood cells transfused but were able to characterize the transfusion event and health care use at the time of the transfusion. We evaluated only treatment that was concurrent with the most recent Hb measurement; thus, our models did not account for time on a given therapy or transitioning among therapies. The potential risks for transfusion for patients who are under consistent care might in fact be lower than what was observed in this study. Another limitation includes the inability to evaluate the impact of anemia symptoms (and physician impressions) on the decision to transfuse. Patient complaints of fatigue and weakness are likely an important factor in deciding whether a patient requires immediate transfusion. The results of this study indicate that many patients with CKD and anemia receive transfusions in the VA, and although the use of interventions such as ESAs and iron decreases transfusion probabilities, transfusion risk still remains elevated. Transfusion events are most likely to occur at Hb levels <10 g/dl, although their use at Hb levels >10 g/dl remains nontrivial. It seems that although physicians evaluate changes in Hb levels over time within individuals and react when Hb levels drop precipitously, current Hb levels and comorbidities seem to drive the decision to transfuse. E.V.L. received research grant funding from Amgen, Inc., with no restrictions on publication; B.D.B. works for the Department of Biostatistics and Epidemiology at Amgen, Inc. The study was conducted using the personnel and resources of the VA Cooperative Studies Program and the facilities and resources of the VA Boston Healthcare System.